I am hopelessly enamored of much of the work of Richard Rodgers and Oscar Hammerstein – the stage musicals, the movies derived from some of their biggest hits, the songs, the themes – and thus entered the opening night performance of Broadway Rose’s A Grand Night for Singing shamelessly biased toward the production. Miraculously, Director Sharon Maroney and her team still managed to exceed my lofty expectations. The review wastes no time on exposition, makes no effort to provide show-specific sets, costumes, or context – and is thus able to pack 36 numbers (representing 39 songs, courtesy of a few medleys) from eleven Rodgers and Hammerstein musicals. In just over two hours, we were treated to five wonderful vocalists, accompanied by Music Director Jeffrey Childs’ marvelous musicians, presenting a variety of songs from Allegro, Cinderella, Carousel, Flower Drum Song, The King and I, Me and Juliet, Oklahoma, Pipe Dream, The Sound of Music, South Pacific, and State Fair – and I loved every minute. Special thanks to Dan Murphy for his curtain speech, where he pointed out to the audience that it is not a sing-along, and thus that the audience should consider it a grand night for listening – as it most certainly was. 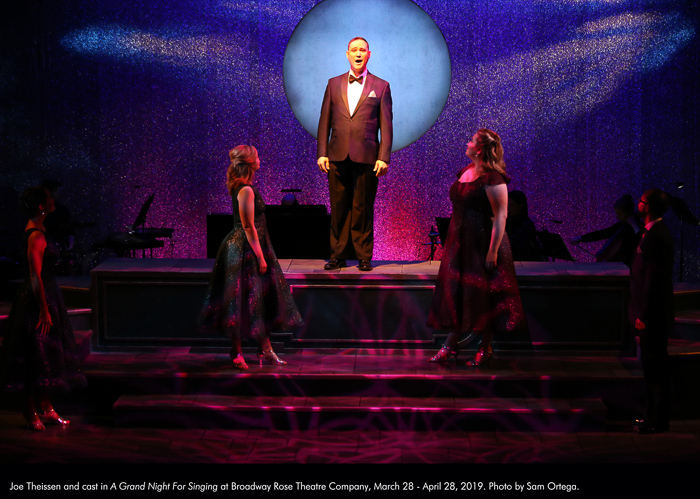 The selection of shows and songs is somewhat counterintuitive – instead of a compendium of Rodgers and Hammerstein’s greatest hits, performed as they might have been in the original shows, the review is seasoned with works from several lesser-known musicals. Even on the most familiar standards, gender switches help to frame iconic songs in an intriguing and original context that allows for a new appreciation. “Honey Bun” – a song designed for a woman pretending to be a man, sung by a man? Revolutionary! The first verse of “Kansas City” sung by a woman? Will Parker would be shocked! “How Do You Solve a Problem Like Maria” takes on a whole new slant when a guy in a tux replaces Mother Superior. Part of the fun for me was comparing the evening’s performances with the songs as I remember them within their full shows – don’t miss “Shall We Dance” and “This Nearly Was Mine” removed from their ethnic overtones, yet still evocative of the authors’ courageous willingness to tackle racial issues in their stories. As much as I love A Grand Night for Singing, I must warn that it is best suited to people who are already in love with musical theater, and who have at least passing familiarity with Rodgers and Hammerstein’s massive oeuvre. Luckily, Broadway Rose has no shortage of fans in this demographic; expect lots of full houses throughout the run, with some shows already sold out. A Grand Night for Singing is playing at Broadway Rose’s New Stage, 12850 SW Grant Avenue, Tigard through Sunday, April 28th.